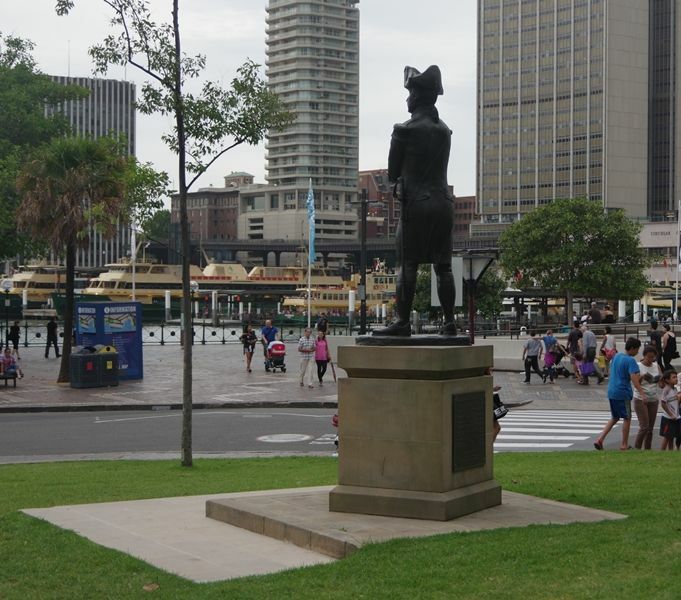 Statue of Captain William Bligh was erected in 1987 to ' restore the proper image of a much maligned and gallant man.' Bligh was Governor of New South Wales from 1806- 1809. Vice Admiral William Bligh (9 September 1754 – 7 December 1817) was an officer of the British Royal Navy and a colonial administrator. A notorious mutiny occurred during his command of HMS Bounty in 1789; Bligh and his loyal men made a remarkable voyage to Timor, after being set adrift in the Bounty's launch by the mutineers. Fifteen years after the Bounty mutiny, he was appointed Governor of New South Wales in Australia, with orders to clean up the corrupt rum trade of the New South Wales Corps, resulting in the so-called Rum Rebellion. On 26 January 1808, the New South Wales Corps under Major George Johnston marched on Government House in Sydney and arrested him. A rebel government was subsequently installed and Bligh, now deposed, made for Hobart in Tasmania aboard HMS Porpoise. 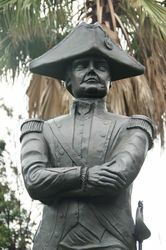 Bligh failed to gain support from the authorities in Hobart to retake control of New South Wales, and remained effectively imprisoned on the Porpoise from 1808 until January 1810. 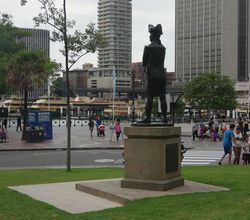 Thus isolated, Bligh stayed until Governor Lachlan Macquarie arrived in Sydney. He returned to Port Jackson on 17 January 1810, but did not finally sail for England until 12 May. After Johnston's trial, Bligh received his routine promotion, first to rear admiral of the Blue, which was backdated to July 1810 when it had become due, and then to vice-admiral in June 1814. William Bligh was born in Plymouth in 1754. He was 21 years old when he joined Captain James Cook as sailing master on H.M.S. Resolution for Cook's third voyage. 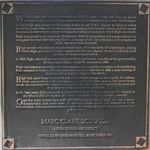 Over the years writers have built misleading legends about Bligh. He was a severe disciplinarian, but never cruel. He was brave and honest, but unfortunate in his subordinates. This monument seeks to restore the proper image of a much maligned and gallant man.